This article is about the Greek myth. For the short story collection by Agatha Christie, see The Labours of Hercules. Driven mad by Hera (queen of the gods), Hercules slew his son, daughter, and wife Megara. After recovering his sanity, Hercules deeply regretted his actions; he was purified by King Thespius, then traveled to Delphi to inquire how he could atone for his actions. Pythia, the Oracle of Delphi, advised him to go to Tiryns and serve his cousin King Eurystheus for twelve years, performing whatever labours Eurystheus might set him; in return, he would be rewarded with immortality. Hercules despaired at this, loathing to serve a man whom he knew to be far inferior to himself, yet fearing to oppose his father Zeus. Eventually, he placed himself at Eurystheus's disposal. Eurystheus originally ordered Hercules to perform ten labours. Hercules accomplished these tasks, but Eurystheus refused to recognize two: the slaying of the Lernaean Hydra, as Hercules' nephew and charioteer Iolaus had helped him; and the cleansing of the Augeas, because Hercules accepted payment for the labour. Eurystheus set two more tasks (fetching the Golden Apples of Hesperides and capturing Cerberus), which Hercules also performed, bringing the total number of tasks to twelve. Heracles's first six labours were located in the Peloponnese. As they survive, the labours of Hercules are not recounted in any single place, but must be reassembled from many sources. Ruck and Staples assert that there is no one way to interpret the labours, but that six were located in the Peloponnese, culminating with the rededication of Olympia. Six others took the hero farther afield, to places that were, per Ruck, "all previously strongholds of Hera or the 'Goddess' and were Entrances to the Netherworld." 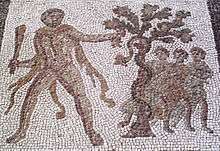 In each case, the pattern was the same: Hercules was sent to kill or subdue, or to fetch back for Eurystheus (as Hera's representative) a magical animal or plant. 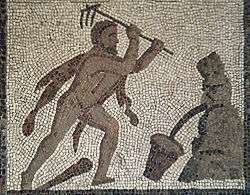 In his labours, Hercules was sometimes accompanied by a male companion (an eromenos), according to Licymnius and others, such as Iolaus, his nephew. Although he was supposed to perform only ten labours, this assistance led to two labours being disqualified: Eurystheus didn't count slaying the Hydra, because Iolaus helped him, nor the cleansing of the Augean stables because Hercules was paid for his services, or because the rivers did the work. Several of the labours involved the offspring (by various accounts) of Typhon and his mate Echidna, all overcome by Hercules. The first labour was to slay the Nemean lion. Hercules wandered the area until he came to the town of Cleonae. There he met a boy who said that if Hercules slew the Nemean lion and returned alive within thirty days, the town would sacrifice a lion to Zeus, but if he did not return within thirty days or he died, the boy would sacrifice himself to Zeus. Another version claims that he met Molorchos, a shepherd who had lost his son to the lion, saying that if he came back within thirty days, a ram would be sacrificed to Zeus. If he did not return within thirty days, it would be sacrificed to the dead Hercules as a mourning offering. While searching for the lion, Hercules fletched some arrows to use against it, not knowing that its golden fur was impenetrable. When he found and shot the lion, firing at it with his bow, he discovered the fur's protective property as the arrow bounced harmlessly off the creature's thigh. After some time, Hercules made the lion return to his cave. The cave had two entrances, one of which Hercules blocked; he then entered the other. In those dark and close quarters, Hercules stunned the beast with his club and, using his immense strength, strangled it to death. During the fight the lion bit off one of his fingers. Others say that he shot arrows at it, eventually shooting it in the unarmored mouth. After slaying the lion, he tried to skin it with a knife from his belt, but failed. He then tried sharpening the knife with a stone and even tried with the stone itself. Finally, Athena, noticing the hero's plight, told Hercules to use one of the lion's own claws to skin the pelt. Others say that Hercules' armor was, in fact, the hide of the lion of Cithaeron. When he returned on the thirtieth day carrying the carcass of the lion on his shoulders, King Eurystheus was amazed and terrified. Eurystheus forbade him ever again to enter the city; from then on he was to display the fruits of his labours outside the city gates. Eurystheus would then tell Hercules his tasks through a herald, not personally. Eurystheus even had a large bronze jar made for him in which to hide from Hercules if need be. Eurystheus then warned him that the tasks set for him would become increasingly difficult. The second labour was to slay the Lernaean Hydra, which Hera had raised just to slay Hercules. Upon reaching the swamp near Lake Lerna, where the Hydra dwelt, Hercules covered his mouth and nose with a cloth to protect himself from the poisonous fumes. He fired flaming arrows into the Hydra's lair, the spring of Amymone, a deep cave that it only came out of to terrorize neighboring villages. 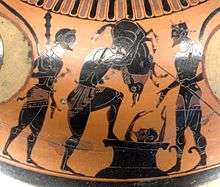 He then confronted the Hydra, wielding a harvesting sickle (according to some early vase-paintings), a sword or his famed club. Ruck and Staples (1994: 170) have pointed out that the chthonic creature's reaction was botanical: upon cutting off each of its heads he found that two grew back, an expression of the hopelessness of such a struggle for any but the hero. The weakness of the Hydra was that only one of its heads was immortal. The details of the struggle are explicit in the Bibliotheca (2.5.2): realizing that he could not defeat the Hydra in this way, Hercules called on his nephew Iolaus for help. His nephew then came upon the idea (possibly inspired by Athena) of using a firebrand to scorch the neck stumps after each decapitation. Hercules cut off each head and Iolaus cauterized the open stumps. Seeing that Hercules was winning the struggle, Hera sent a large crab to distract him. He crushed it under his mighty foot. He cut off the Hydra's one immortal head with a golden sword given to him by Athena. Hercules placed it under a great rock on the sacred way between Lerna and Elaius (Kerenyi 1959:144), and dipped his arrows in the Hydra's poisonous blood, and so his second task was complete. The alternative version of this myth is that after cutting off one head he then dipped his sword in it and used its venom to burn each head so it couldn't grow back. Hera, upset that Hercules had slain the beast she raised to kill him, placed it in the dark blue vault of the sky as the constellation Hydra. She then turned the crab into the constellation Cancer. Hercules later used an arrow dipped in the Hydra's poisonous blood to kill the centaur Nessus; and Nessus's tainted blood was applied to the Tunic of Nessus, by which the centaur had his posthumous revenge. Both Strabo and Pausanias report that the stench of the river Anigrus in Elis, making all the fish of the river inedible, was reputed to be due to the Hydra's poison, washed from the arrows Hercules used on the centaur. Eurystheus and Hera were greatly angered that Hercules had survived the Nemean Lion and the Lernaean Hydra. For the third labour, they found a task which they thought would spell doom for the hero. It was not slaying a beast or monster, as it had already been established that Hercules could overcome even the most fearsome opponents. Instead, Eurystheus ordered him to capture the Ceryneian Hind, which was so fast that it could outrun an arrow. After beginning the search, Hercules awoke from sleeping and saw the hind by the glint on its antlers. Hercules then chased the hind on foot for a full year through Greece, Thrace, Istria, and the land of the Hyperboreans. In some versions, he captured the hind while it slept, rendering it lame with a trap net. In other versions, he encountered Artemis in her temple; she told him to leave the hind and tell Eurystheus all that had happened, and his third labor would be considered to be completed. Yet another version claims that Hercules trapped the Hind with an arrow between its forelegs. Eurystheus had given Hercules this task hoping to incite Artemis's anger at Hercules for his desecration of her sacred animal. 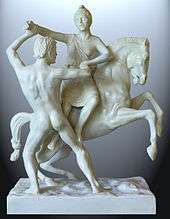 As he was returning with the hind, Hercules encountered Artemis and her brother Apollo. He begged the goddess for forgiveness, explaining that he had to catch it as part of his penance, but he promised to return it. Artemis forgave him, foiling Eurystheus' plan to have her punish him. Upon bringing the hind to Eurystheus, he was told that it was to become part of the King's menagerie. Hercules knew that he had to return the hind as he had promised, so he agreed to hand it over on the condition that Eurystheus himself come out and take it from him. The King came out, but the moment that Hercules let the hind go, it sprinted back to its mistress, and Hercules left saying that Eurystheus had not been quick enough. Eurystheus was disappointed that Hercules had overcome yet another creature and was humiliated by the Hind's escape, so he assigned Hercules another dangerous task. By some accounts, the fourth labour was to bring the fearsome Erymanthian Boar back to Eurystheus alive (there is no single definitive telling of the labors). On the way to Mount Erymanthos where the Boar lived, Hercules visited Pholus ("caveman"), a kind and hospitable centaur and old friend. Hercules ate with Pholus in his cavern (though the centaur devoured his meat raw) and asked for wine. 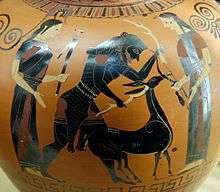 Pholus had only one jar of wine, a gift from Dionysus to all the centaurs on Mount Erymanthos. Hercules convinced him to open it, and the smell attracted the other centaurs. They did not understand that wine needs to be tempered with water, became drunk, and attacked Hercules. Hercules shot at them with his poisonous arrows, killing many, and the centaurs retreated all the way to Chiron's cave. Pholus was curious why the arrows caused so much death. He picked one up but dropped it, and the arrow stabbed his foot, poisoning him. One version states that a stray arrow hit Chiron as well; Chiron was immortal, but he still felt the pain. Chiron's pain was so great that he volunteered to give up his immortality and take the place of Prometheus, who had been chained to the top of a mountain to have his liver eaten daily by an eagle, although he was an immortal Titan. Prometheus' torturer, the eagle, continued its torture on Chiron, so Hercules shot it dead with an arrow. It is generally accepted that the tale was meant to show Hercules as being the recipient of Chiron's surrendered immortality. However, this tale contradicts the fact that Chiron later taught Achilles. The tale of the Centaurs sometimes appears in other parts of the twelve labours, as does the freeing of Prometheus. Hercules had visited Chiron to gain advice on how to catch the Boar, and Chiron had told him to drive it into thick snow, which sets this Labour in mid-winter. Hercules caught the Boar, bound it, and carried it back to Eurystheus, who was frightened of it and ducked down in his half-buried storage pithos, begging Hercules to get rid of the beast. The fifth labour was to clean the stables of King Augeas. This assignment was intended to be both humiliating (rather than impressive, as the previous labours had been) and impossible, since the livestock were divinely healthy (and immortal) and therefore produced an enormous quantity of dung. The Augean /ɔːˈdʒiːən/ Stables had not been cleaned in over 30 years, and over 1,000 cattle lived there. However, Hercules succeeded by re-routing the rivers Alpheus and Peneus to wash out the filth. The success of this labour was ultimately discounted because the rushing waters had done the work of cleaning the stables and because Hercules was paid for it. Eurystheus said that Hercules still had seven labours to perform. The sixth labour was to defeat the Stymphalian birds, man-eating birds with beaks of bronze and sharp metallic feathers they could launch at their victim. They were sacred to Ares, the god of war. Furthermore, their dung was highly toxic. They had migrated to Lake Stymphalia in Arcadia, where they bred quickly and took over the countryside, destroying local crops, fruit trees, and townspeople. Hercules could not go too far into the swamp, for it would not support his weight. Athena, noticing the hero's plight, gave Hercules a rattle which Hephaestus had made especially for the occasion. Hercules shook the rattle and frightened the birds into the air. Hercules then shot many of them with his arrows. The rest flew far away, never to return. The Argonauts would later encounter them. The seventh labour was to capture the Cretan Bull. Hercules sailed to Crete, where King Minos gave Hercules permission to take the Bull away and even offered him assistance (which Hercules declined because of pride). The Bull had been wreaking havoc on Crete by uprooting crops and leveling orchard walls. Hercules sneaked up behind the Bull and then used his hands to throttle it (stopping before it was killed), and then shipped it back to Tiryns. Eurystheus, who hid in his pithos at first sight of the creature, wanted to sacrifice the Bull to Hera, who hated Hercules. She refused the sacrifice because it reflected glory on Hercules. The Bull was released and wandered into Marathon, becoming known as the Marathonian Bull. Theseus would later sacrifice the bull to Athena and/or Apollo. The eighth labour was to bring back the Mares of Diomedes, which had been trained to eat human flesh by their owner, King Diomedes of Thrace. In one version of the story, Hercules brought a number of youths to help him. They took the mares, called Podargos ("swift-footed"), Lampon ("the shining"), Xanthos ("the blond"), and Deinos ("the terrible"), and were chased by Diomedes and his men. Hercules was not aware that the horses were kept tethered to a bronze manger because they were wild; their madness being attributed to an unnatural diet of human flesh. Some versions say that they expelled fire when they breathed. They were man-eating and uncontrollable, and Hercules left his favoured companion, Abderus, in charge of them while he fought Diomedes, and found out that the boy was eaten. In revenge, Hercules fed Diomedes to his own horses, then founded the city of Abdera next to the boy's tomb. In another version, Hercules stayed awake so that he didn't have his throat cut by Diomedes in the night, and cut the chains binding the horses. Having scared the horses onto the high ground of a peninsula, Hercules quickly dug a trench through the peninsula, filling it with water, thus making it an island. When Diomedes arrived, Hercules killed him with the axe he had used to dig the trench, and fed the body to the horses to calm them. Both versions have eating making the horses calmer, and Hercules took the opportunity to bind their mouths shut, and easily took them back to Eurystheus, who dedicated the horses to Hera. In some versions, they were allowed to roam freely around Argos, having become permanently calm. In others, Eurystheus ordered the horses taken to Olympus to be sacrificed to Zeus, but Zeus refused them, and sent wolves, lions, and bears to kill them. Roger Lancelyn Green states in his Tales of the Greek Heroes that their descendants were used in the Trojan War. Eurystheus' daughter Admete wanted the Belt of Hippolyta, queen of the Amazons, a gift from her father Ares. To please his daughter, Eurystheus ordered Hercules to retrieve the Belt as his ninth labour. 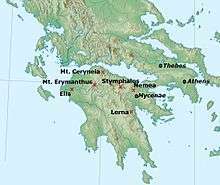 Taking a band of friends with him, Hercules set sail, stopping at the island of Paros, which was inhabited by some sons of Minos. The sons killed two of Hercules' companions, an act which set Hercules on a rampage. He killed two of the sons of Minos and threatened the other inhabitants until he was offered two men to replace his fallen companions. Hercules agreed and took two of Minos' grandsons, Alcaeus and Sthenelus. They continued their voyage and landed at the court of Lycus, whom Hercules defended in a battle against King Mygdon of Bebryces. After killing King Mygdon, Hercules gave much of the land to his friend Lycus. Lycus called the land Heraclea. The crew then set off for Themiscyra where Hippolyta lived. All would have gone well for Hercules had it not been for Hera. Hippolyta, impressed with Hercules and his exploits, agreed to give him the belt and would have done so had Hera not disguised herself and walked among the Amazons sowing seeds of distrust. She claimed the strangers were plotting to carry off the queen of the Amazons. Alarmed, the women set off on horseback to confront Hercules. When Hercules saw them, he thought Hippolyta had been plotting such treachery all along and had never meant to hand over the Belt, so he killed her, took the Belt and returned to Eurystheus. The tenth labour was to obtain the Cattle of Geryon. In the fullest account in the Bibliotheca of Pseudo-Apollodorus, Hercules had to go to the island of Erytheia in the far west (sometimes identified with the Hesperides), or with the island which forms the city of Cádiz) to get the Cattle. On the way there, he crossed the Libyan desert and became so frustrated at the heat that he shot an arrow at the Sun. The sun-god Helios "in admiration of his courage" gave Hercules the golden chariot Helios used to sail across the sea from west to east each night. 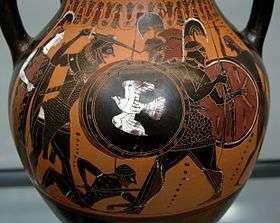 Hercules rode the chariot to Erytheia; Hercules in the chariot was a favorite motif on black-figure pottery. Such a magical conveyance undercuts any literal geography for Erytheia, the "red island" of the sunset. Orthrus, as slain by Hercules during the tenth labour. When Hercules landed at Erytheia, he was confronted by the two-headed dog Orthrus. With one blow from his olive-wood club, Hercules killed Orthrus. Eurytion the herdsman came to assist Orthrus, but Hercules dealt with him the same way. On hearing the commotion, Geryon sprang into action, carrying three shields and three spears, and wearing three helmets. He attacked Hercules at the River Anthemus, but was slain by one of Hercules' poisoned arrows. Hercules shot so forcefully that the arrow pierced Geryon's forehead, "and Geryon bent his neck over to one side, like a poppy that spoils its delicate shapes, shedding its petals all at once." Hercules then had to herd the Cattle back to Eurystheus. In Roman versions of the narrative, Hercules drove the Cattle over the Aventine Hill on the future site of Rome. The giant Cacus, who lived there, stole some of the Cattle as Hercules slept, making the Cattle walk backwards so that they left no trail, a repetition of the trick of the young Hermes. According to some versions, Hercules drove his remaining cattle past the cave, where Cacus had hidden the stolen animals, and they began calling out to each other. In other versions, Cacus' sister Caca told Hercules where he was. Hercules then killed Cacus, and set up an altar on the spot, later the site of Rome's Forum Boarium (the cattle market). To annoy Hercules, Hera sent a gadfly to bite the cattle, irritate them, and scatter them. Hercules within a year retrieved them. Hera then sent a flood which raised the level of a river so much, Hercules could not cross with the cattle. He piled stones into the river to make the water shallower. When he finally reached the court of Eurystheus, the cattle were sacrificed to Hera. After Hercules completed the first ten labours, Eurystheus gave him two more claiming that slaying the Hydra didn't count (because Iolaus helped Hercules) nor did cleaning the Augean Stables (either because he was paid for the job or because the rivers did the work). The first additional Labour was to steal the apples from the garden of the Hesperides. Hercules first caught the Old Man of the Sea, the shape-shifting sea god, to learn where the Garden of the Hesperides was located. In some variations, Hercules, either at the start or at the end of this task, meets Antaeus, who was invincible as long as he touched his mother, Gaia, the earth. Hercules killed Antaeus by holding him aloft and crushing him in a bearhug. Herodotus claims that Hercules stopped in Egypt, where King Busiris decided to make him the yearly sacrifice, but Hercules burst out of his chains. Hercules finally made his way to the Garden of the Hesperides, where he encountered Atlas holding up the heavens on his shoulders. Hercules persuaded Atlas to get some of the golden Apples for him, by offering to hold up the heavens in his place for a little while. (Atlas could get the Apples because, in this version, he was the father or otherwise related to the Hesperides.) This would have made the labour – like the Hydra and the Augean Stables – void because Hercules had received help. When Atlas returned, he decided that he did not want to take the heavens back, and instead offered to deliver the Apples himself. But Hercules tricked him by agreeing to remain in place of Atlas on condition that Atlas relieve him temporarily while Hercules adjusted his cloak. Atlas agreed, but Hercules reneged and walked away with the Apples. According to an alternative version, Hercules slew Ladon, the dragon-like guardian of the Apples, instead. Eurystheus was furious that Hercules had accomplished something that Eurystheus thought could not possibly be done. The twelfth and final labour was the capture of Cerberus, the 3-headed hound that was guardian of the gates of the underworld. To prepare for his descent into the underworld Hercules went to Eleusis (or Athens) to be initiated in the Eleusinian Mysteries. He entered the underworld, and Hermes and Athena were his guides. While in the Underworld, Hercules met Theseus and Pirithous. The two companions had been imprisoned by Hades for attempting to obtain Persephone. One tradition tells of snakes coiling around their legs then turning into stone; another that Hades feigned hospitality and prepared a feast inviting them to sit. They unknowingly sat in chairs of forgetfulness and were permanently ensnared. When Hercules had pulled Theseus first from his chair, some of his thigh stuck to it (this explains the supposedly lean thighs of Athenians), but the earth shook at the attempt to liberate Pirithous, whose desire to have the goddess for himself was so insulting he was doomed to stay behind. Hercules found Hades and asked permission to bring Cerberus to the surface, which Hades agreed to if Hercules could subdue the beast without using weapons. 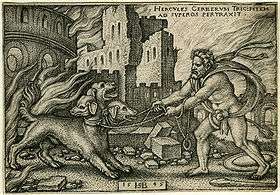 Hercules overpowered Cerberus with his hands and slung the beast over his back. He carried Cerberus out of the Underworld through a cavern entrance in the Peloponnese and brought it to Eurystheus, who again fled into his pithos. Eurystheus begged Hercules to return Cerberus to the Underworld, offering in return to release him from any further labours. After completing the Twelve Labours, one tradition says Hercules joined Jason and the Argonauts in their quest for the Golden Fleece. However Herodorus (c. 400 BC) disputed this, and denied Hercules ever sailed with the Argonauts. A separate tradition (e.g. Argonautica) has Hercules accompany the Argonauts, but he did not travel with them as far as Colchis. ↑ (Pseudo-)Apollodorus (1921). "2.4.12". The Library (in Greek). With an English Translation by Sir James George Frazer, F.B.A., F.R.S. in 2 Volumes. Cambridge, MA; London: Harvard University Press; William Heinemann Ltd. At the Perseus Project. ↑ Isocrates. "1.8". Isocrates (in Greek). With an English Translation in three volumes, by George Norlin, Ph.D., LL.D. Cambridge, MA; London: Harvard University Press; William Heinemann Ltd. At the Perseus Project. ↑ According to Walter Burkert. 1 2 Ruck, Carl; Danny Staples (1994). The World of Classical Myth. Durham, NC, USA: Carolina Academic Press. p. 169. ↑ Kerenyi, The Heroes of the Greeks (angelo) 1959:144. ↑ Strabo, viii.3.19, Pausanias, v.5.9; Grimal 1987:219. ↑ Pindar. The Extant Odes of Pindar, Project Gutenberg. ↑ Hamilton, Edith (1969). Mythology: Timeless Tales of Gods and Heroes. NY: Warner. p. 172. ↑ Stephen M. Trzaskoma; R. Scott Smith; Stephen Brunet; Thomas G. Palaima (1 March 2004). Anthology of Classical Myth: Primary Sources in Translation. Hackett Publishing. p. 226. ISBN 1-60384-427-9. ↑ Libya was the generic name for North Africa to the Greeks. ↑ Stesichorus, fragment, translated by Denys Page. 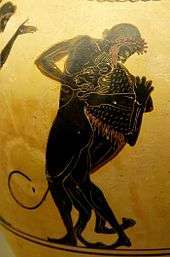 ↑ Kerenyi, The Heroes of the Greeks, 1959, p.172, identifies him in this context as Nereus; as a shape-shifter he is often identified as Proteus. ↑ In some versions of the tale, Hercules was directed to ask Prometheus. As payment, he freed Prometheus from his daily torture. 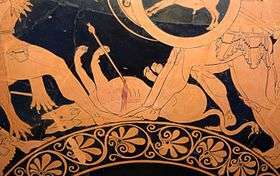 This tale is more usually found as part of the story of the Erymanthian Boar, since it is associated with Chiron choosing to forgo immortality and taking Prometheus' place. Burkert, Walter (1985). Greek Religion. Cambridge, MA, USA: Harvard University Press. Wikimedia Commons has media related to Twelve Labours.